I'm not the hugest fan of summer. I'm not sure why everyone loves the extreme heat, humidity and bugs, but if there's one thing I can get down with, it's a perfectly ripe tomato. Tomatoes just taste better when they're in season. 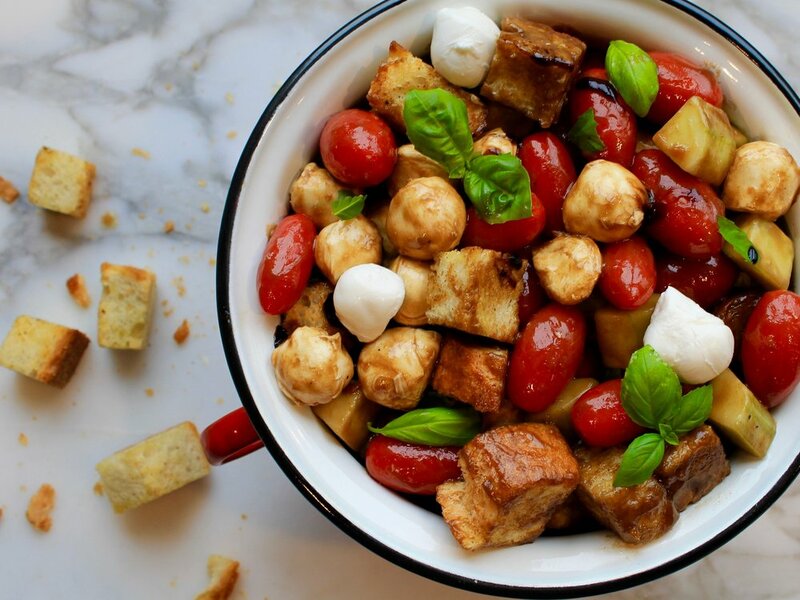 Panzanella and caprese are two of my favorite tomato dishes so I like to put them together for the ultimate summer side. Make the salad about 15 minutes before serving to allow the dressing to slightly soften the toasted bread. In a large serving bowl, combine the tomatoes, cucumber, mozzarella, basil and toasted bread. Drizzle some of the dressing, to your liking, over the salad and toss to combine. Add the bread to a large bowl. Drizzle the oil evenly over the bread. Add the salt, garlic powder and pepper and toss to coat the bread. Place the cubes on a baking sheet and bake until golden brown, about 18 minutes. In a medium bowl, whisk together the balsamic vinegar, balsamic glaze and Dijon mustard. While constantly whisking, drizzle in the olive oil to emulsify. Add the salt and pepper and whisk to combine. TIP: This makes a generous amount of dressing. Dress the salad to your liking. Also, I use balsamic glaze in this recipe for some depth and sweetness. If you do not have any, use an additional tablespoon of balsamic vinegar and a touch of honey.